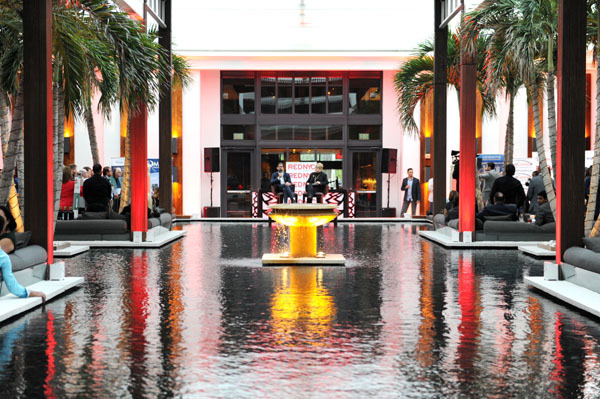 Last Wednesday evening, May 9th over 500 attendees packed the REDinMIA launch event at Setai South Beach which featured David Martin, President of Terra Group for the RED signature “Fireside Chat” interview conducted by CEO of the Miami Association of Realtors, Teresa King Kinney. I was honored to co-host this Miami event with the two REDinMIA founding partners, Cagri Kanver and Selman Yalcin. These two hip entrepreneurs saw a way to make these gatherings more fun while benefiting all in attendance. It is not just for those working in any facet of the real estate industry, but for any and everyone who understands that investing in real estate is one of the best ways to have a secure investment portfolio that hopefully reaps a handsome profit. Plus, the events are high energy, mixing business with pleasure and entertainment. The REDinMIA event included a DJ and live performance by a contortionist. This cool networking group started in NYC with REDinNYC, then added Chicago with REDinCHI and Los Angeles with REDinLA coming up soon. Thus, REDinMIA is part of the nationwide New York City based premiere professional real estate networking organization founded in 2017. Since its inception just one year ago, RED has attracted over 10,000 real estate professionals to their evens in New York City, Chicago and Miami. Los Angeles is up next followed by other key U.S. cities like Boston and Philadelphia. The events attract top developers, investors, family offices, contractors, lawyers, architects, engineers and the wide spectrum of those dealing with the local and national real estate development landscape. Proud sponsors of the May 9th event included the Miami Association of Realtors, the top commercial real estate tech platform, RealConnex founded by Roy Abrams, and the evening’s media sponsor, Bisnow, the nation’s most prominent real estate conference and seminar organization. Lending Bankers headquartered in Miami also supported the event and were in attendance to educate guests on numerous lending options available in today’s market. Miami based, World Red Eye captured the evening event in photos. For a full list of sponsors see details and websites below.